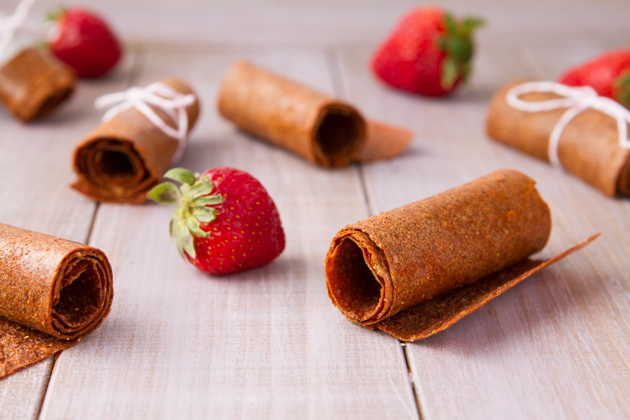 A healthy vegetable and fruit-based smoothie, made into fruit leathers for the perfect portable snack. It will work with any of your favorite smoothie recipes! It’s hard to believe that I’m already on day 4 of my 5-day juice kit-cleanse from Total Cleanse. As nice as it is to have full control over the juices I enjoy in a cleanse, the convenience of just walking over to my fridge and grabbing a pre-made juice has been a nice change. Because of the cost, I’m not sure I would do a kit-cleanse for all of my juice cleanses so I’m soaking in this experience while I can. Enter to win a 3-day kit cleanse of your very own here (just scroll to the bottom of my post for the giveaway instructions). So, tomorrow will be the last day of my cleanse. Then, I’ll be transitioning over to solid foods. I usually do 1-2 days of various smoothies, followed by 2 days of steamed veggies, then I add in nuts/seeds, and lastly, animal protein. The whole transition takes about 7 days. The problem with the smoothie days is that it’s a bit challenging to take smoothies with me on the go. So, I came up with a way I can still enjoy my post-cleanse smoothies without having to worry about refrigeration. To print, text or email this recipe, click here. 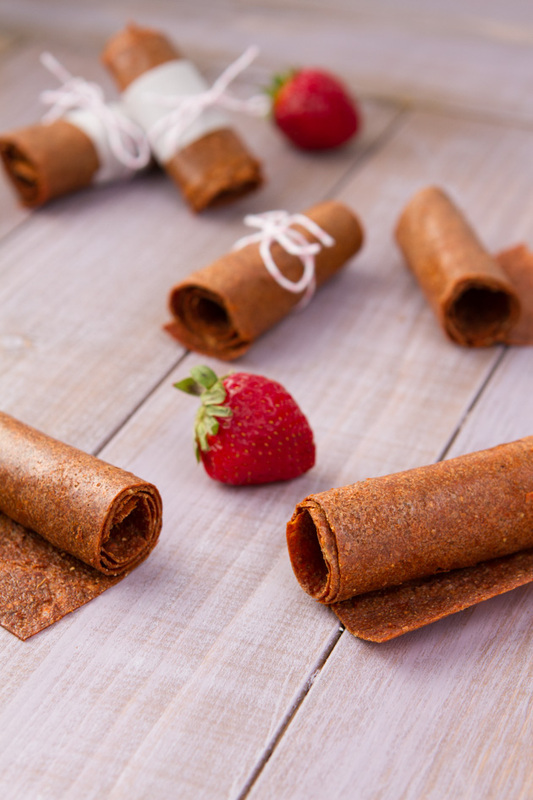 A healthy vegetable and fruit-based smoothie, made into fruit leathers for the perfect portable snack! 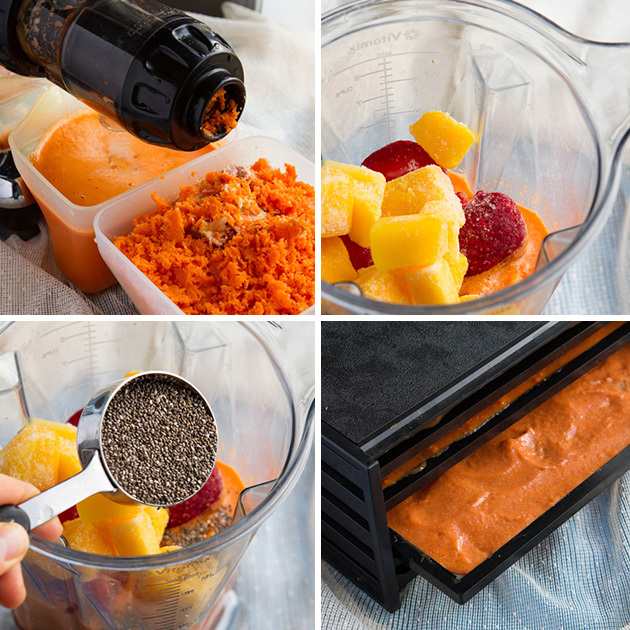 Add ingredients to the jug of your high powered blender. Blend on high, until smooth. For dehydrator method: (I use this dehydrator), spread the fruit mixture on teflex sheets until they're about ⅛-inch in thickness. Dehydrate for 5-6 hours at 105F. For oven method: Preheat oven to 150F or the lowest temperature it will go. Line a 11x17 baking sheet with a silicon baking mat or parchment paper. 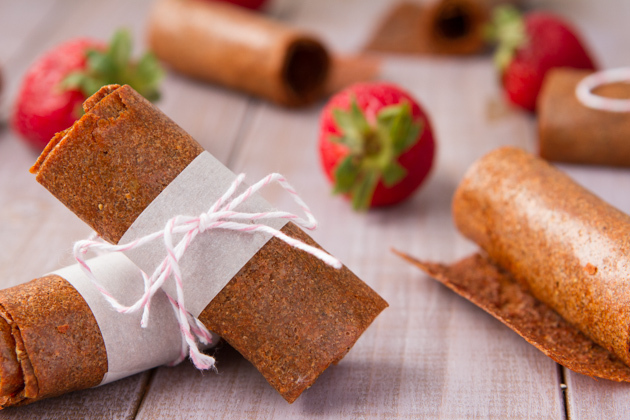 Pour the fruit mixture onto prepared baking sheet and spread to about a ⅛-inch thick. Place baking sheet in the oven and bake for 6-8 hours, until pan is set and the center is not tacky. Remove from oven and let cool to room temperature. Storage: Cut into squares or strips using scissors. 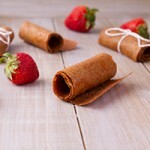 If you want to make fruit roll-ups, roll the strips in parchment paper. Store in an air-tight container. 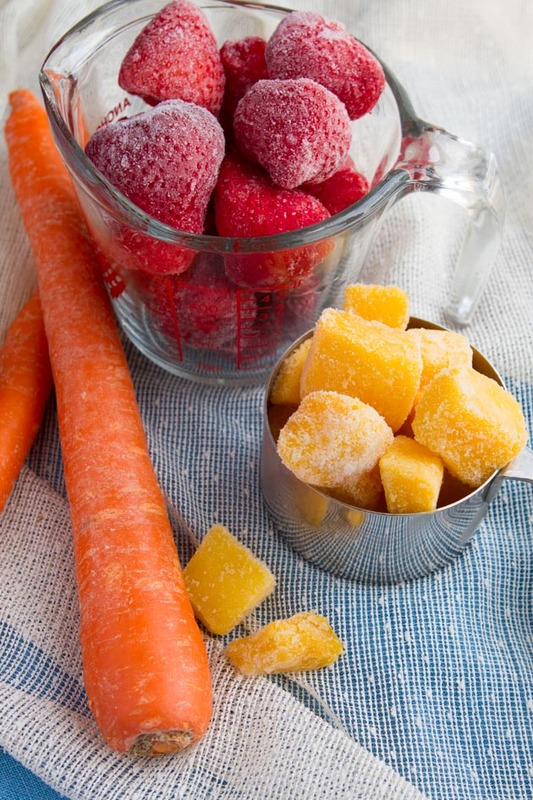 I used frozen mango and strawberries for this recipe. If you’re going to go this route, make sure that you defrost them before you use them for this recipe. Interested in learning more about how to transition from a juice cleanse? Check out days 1 and 2 of my 3-day juice and smoothie cleanse program it’s the perfect way to reintroduce food to your system after a couple of days of juicing. And once you’re done that, you could follow it up with week two of my 2-week cleanse program. You’ll be cleansed and glowing in no time!